This is another box I’ve built without bothering to design it first. I should get away from that practice. This is made of cherry. Shellac finish. I used my newly built miter sled to cut the corners. They fit pretty well, I think. For no good reason other than to do it, I used a very thin piece of cherry (1/8”), and made a lid on the lower section. I couldn’t put a knob on it because I thought I’d want to build a little tray (again, designing as I progressed). So, I cut a little notch on the edge, and made a little key (more like a miniature harpoon) to hook the lid. I put a thumbnail-sized nub on it just to make it less likely to disappear. The compartment lid is captured between the sides, with little 1/8” dia. posts that fit into pivot holes. 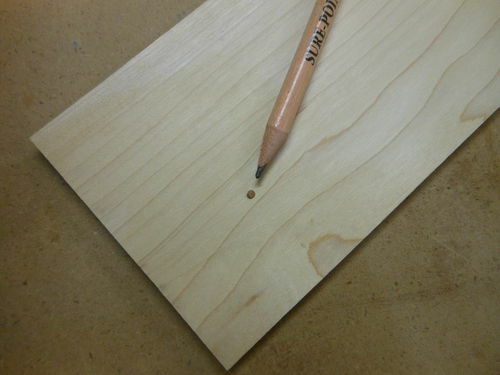 One of the holes was too deep, so I cut a tiny dot of cherry to put into the bottom of the hole. Had to do that twice because I sneezed on the first one, and when I opened my eyes it was gone. The pawn shaped knob for the tray was turned on the lathe. I left a 3/8” x 1/8”dia post on it, and put that all the way through the tray floor. Used a dozuki saw to split it, and then pushed in a tiny wedge. Definitely needed the drugstore reading glasses for that. There’s no more than a paper thickness between the top of that knob and the bottom of the box lid. After I took the pictures, I finished applying shellac to the interior. The sides are about 5/16” thick. The bottom and top are about 7/8” and 3/4”, respectively. That makes the box much heavier than it appears. The bottom is rabbeted and fit into 1/4” grooves. The lid is also rabbeted so that it fits into the top. That’s really nice. Beautiful wood, too. Who needs plans? Sometimes you just have to go with your gut. It turned out nice, well done, Sir! Very nice. I like to see people try new things. Plans , What are you Nuts. Very good job on the box.